The delicate fragment raises questions. Scientists found the carbon-rich fragment of a comet embedded within a meteorite (at white arrow). The meteorite's colors can be seen by shining polarized light through a thin slice, and the grid lines show intervals of one millimeter. Our perception of the early solar system just got warped. Researchers have found a piece of a comet — an object made up of ice and dust — inside of a space rock known as a stony meteorite. Researchers made the strange find in a meteorite that smacked down in Antarctica's LaPaz Icefield, a popular location for people hunting for space rocks. Embedded inside the meteorite was a carbon-rich dust particle that looks very similar to those already seen in comets, researchers said in a statement. The find is interesting because comets and meteorite parent bodies (also known as asteroids) can originate in very different areas of the solar system. Both types of small worlds came from the large collection of gas and dust available in the young solar system, around 4.5 billion years ago. Comets tend to form far out in the solar system, away from the sun's heat, where ice resides, while asteroids are made of tougher stuff and can form just about anywhere. Meteorites occur when pieces break off larger space rocks and plunge through Earth's atmosphere before slamming into the planet's surface. (As it's burning up, it's called a meteor — only if some part makes it down is it called a meteorite.) Most of a meteorite's material does get burned away before making it all the way down, making the comet dust find superspecial for scientists. "I knew we were looking at something very rare," Arizona State University research scientist Jemma Davidson, a co-author on the new work, said in the statement. "It was one of those exciting moments you live for as a scientist." 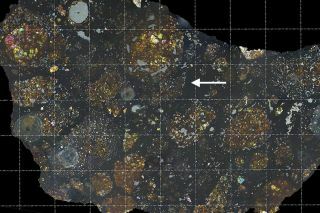 Analysis of the LaPaz meteorite suggests that this dust fragment was captured very early in the solar system's history, only 3 million to 3.5 million years after the sun was formed. Further chemical and elemental studies suggested that the dust particle probably came from the Kuiper Belt, a region of icy objects beyond Neptune's orbit where many comets come from. A close study of this meteorite will reveal some clues about the early solar system's formation. For example, this dust particle probably got inside the meteorite because it migrated from the Kuiper Belt to the region near Jupiter, where carbonaceous chondrite asteroids like the parent of the LaPaz meteorite formed. Carbonaceous chondrites formed early in the solar system's history and their meteorites are among the rarest types found on Earth. "Because this sample of cometary building block material was swallowed by an asteroid and preserved inside this meteorite, it was protected from the ravages of entering Earth's atmosphere," the study's lead author, Larry Nittler, a cosmochemist at Carnegie University, said in the same statement. "It gave us a peek at material that would not have survived to reach our planet's surface on its own, helping us to understand the early solar system's chemistry." A paper based on the research was published April 15 in the journal Nature Astronomy.